For the past two years, I have been meeting with approximately 10 women once per month as part of a book club. Each month, we choose a book, read it, then come together to discuss it. 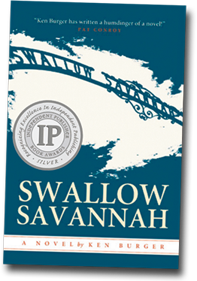 The book for March 2010 was Ken Burger’s Swallow Savannah. What a great choice! First, our club consists of women mostly from other parts of the country – the book’s rich description of setting and characters really educated us on an unimaginable era and mindset. Second, the tale makes for a real page-turner. Finally, we were fortunate to have the author join us for our meeting. Experiencing Ken’s jubilant personality contrasted with the dark tale was really interesting, and hearing the challenges he faced during the early writing stages and getting his perspective on the book’s weaknesses was different. It really made for a great meeting. Carrie Blair-Fussell, Mt. Pleasant, S.C.